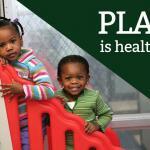 Play and learning are not separate activities: they are intertwined. Think about them as a science lecture with a lab. Play is the child’s lab. Nothing is as natural as a child at play. After a month of little more than eating and sleeping, infants begin to engage in play with their parents and the world around them. Left alone, young children will launch into imaginary play, inventing characters and stories. Put together with peers, children will almost instinctually organize games and activities. 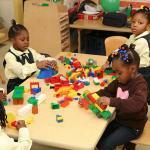 Preschool — it's not just about the sandbox anymore. 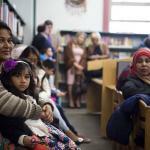 As elementary school becomes more rigorous, so does preschool. 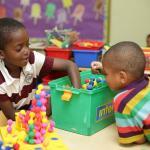 Children are expected to learn certain skills in preschool so that they are prepared for elementary school. Considering the limited time in a preschool setting and the pressure for success later on, where does play fit in? 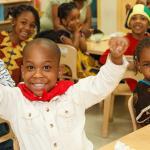 According to one recent report by the Campaign for Children and United Neighborhood Houses: By the city's own measures, Pre-K programs run by community-based organizations [like The Friends of Crown Heights Educational Centers] outperform their public school counterparts in nine out of 10 quality metrics, including classroom organization and language reasoning. In addition to providing life-changing educational opportunities for children, free Universal Pre-K also saves the average family as much as $10,000 a year in childcare costs. 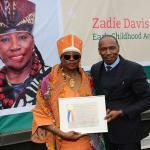 The former Tabernacle Church of God in Christ Day Care Center at 34-52 Kosciuszko Street in Brooklyn's historic Bedford Stuyvesant section is now officially renamed for incumbent Executive Director Zadie Davis.